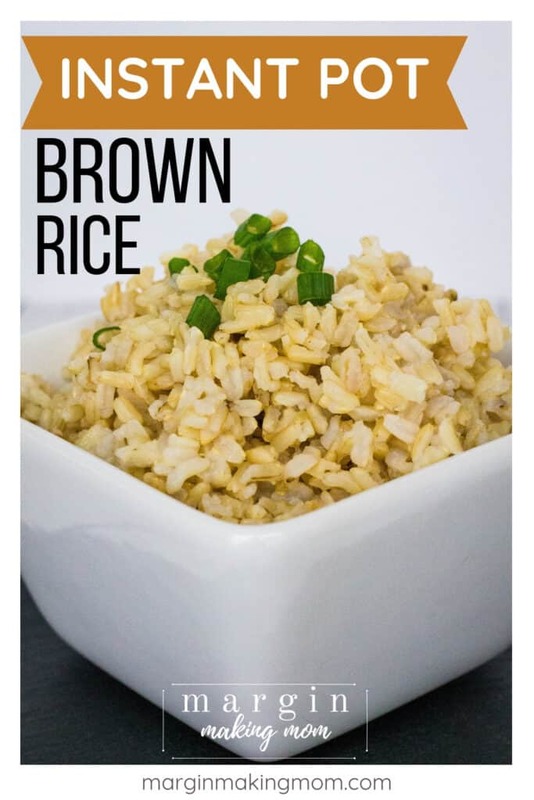 Making Instant Pot brown rice couldn’t be easier! 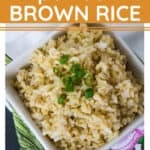 Set it and forget it, then enjoy your perfect brown rice as a quick side dish! 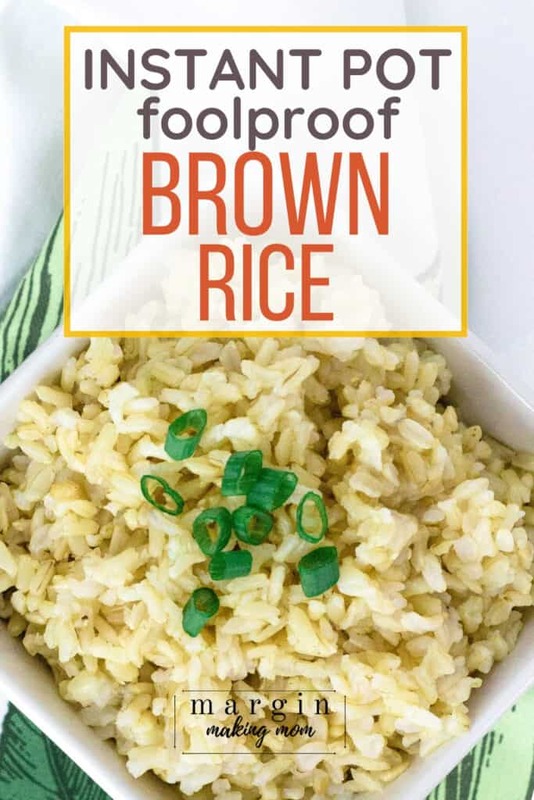 You’ll love this foolproof Instant Pot brown rice recipe–it’s simple to make extra for meal prep or to freeze, and you can always have cooked rice on hand to reheat! Confession time: I’ve always had trouble making rice. After years of cooking most of our meals at home, I consider myself to be pretty decent in the kitchen. But making the perfect rice has never been my strong suit. I have never owned a rice cooker, so I’ve always gone the stove top route. And it’s always turned out okay, just not perfect. I’ve always followed the directions on the package…how hard can it be, right? Yet my attempts would inevitably end with a pot boiling over, and the rice itself often it seemed too gummy or too sticky and just not quite right. Usually if I’m making rice, it’s going to be served underneath of a meat and sauce. Sweet and sour chicken, beef and broccoli, and so forth. 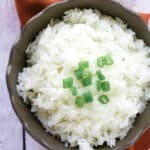 If I’m making the rice as a stand-alone side dish, I typically go the route of an easy and delicious rice pilaf that is baked in the oven, or even a tasty veggie fried rice. Rice is such a frugal addition to meals, and there are endless tasty possibilities of meal options to make with it. First and foremost, I get perfect rice every time in my Instant Pot. Not only that, but there’s no messes from boiled-over pots. And there’s no babysitting the pot. It’s a set-it-and-forget-it situation. But the best part? It’s a cinch to do it. This Instant Pot brown rice barely even qualifies as a recipe (more of a how-to, maybe? ), but it’s come in handy many times for me. 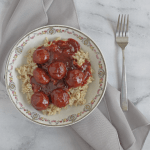 Regardless of how you serve it, you’ll love just how quick and easy it is to make Instant Pot brown rice. 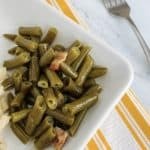 It really is such a versatile side item that’s ready in no time. Perfect for those evenings when you need to get dinner on the table quickly! And if you’re like me and have never been able to get stovetop rice “just right,” you’ll love this cooking method! 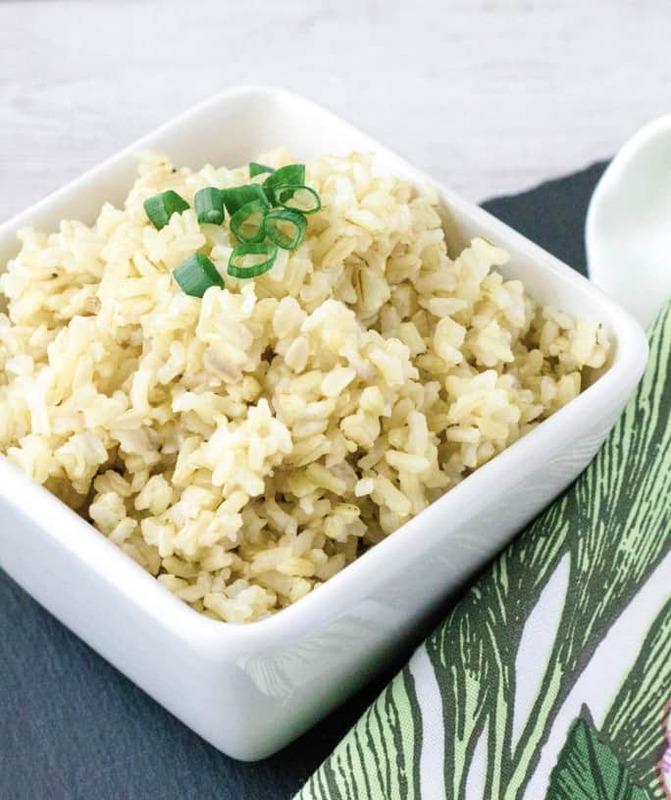 Follow these simple steps to make perfect, fluffy brown rice in your Instant Pot! I like to follow a ratio of 1 cup of brown rice to 1 1/3 cup of water. This ratio allows for rice that is soft and fluffy, but not watery. In my opinion, it’s perfect! You can use broth instead of water, in which case the ratio is still the same. This ratio is also the same if you double or triple the recipe. For instance, if you’re using 2 cups of dry brown rice, you’ll use 2 3/4 cups of liquid. 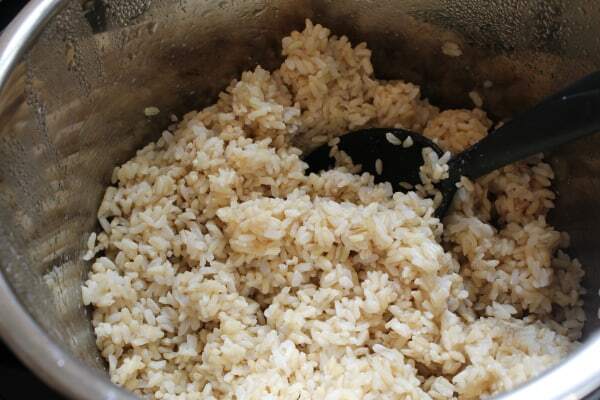 In general, brown rice triples in volume when cooked, so that should help you gauge how much you need to make. Just be sure you don’t exceed the recommended capacity of your pressure cooker. In the insert pot of your Instant Pot, combine the dry rice and liquid. I also like to add a little salt if I’m using water, but I leave that out if I’m using broth. Select a cook time of 22 minutes at high pressure. I use the Manual/Pressure Cook setting. Once the cook time is complete, allow at least a 10 minute natural release followed by a quick release of any remaining pressure. 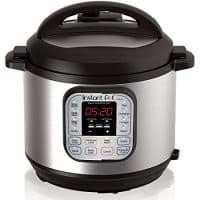 I generally just use a full natural release (the amount of time this takes varies a bit depending on how much rice is in your Instant Pot). After the pressure has released and the valve has dropped, carefully remove the lid. Fluff the rice with a fork and serve as desired! If you prefer, you can make the rice using the pot in pot method instead of cooking it directly in the insert pot. 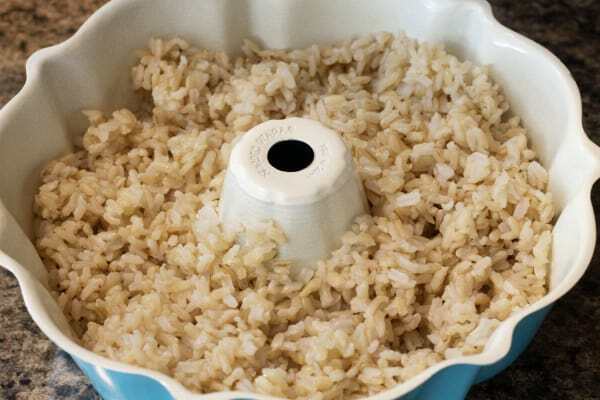 In the pot in pot method, you combine the rice and liquid in a small dish that fits down into the insert pot of your Instant Pot. This method can be ideal if you’re cooking a smaller amount, or if you don’t want to have to clean the insert pot, or if you are cooking more than one thing in the Instant Pot at the same time (as described in this Instant Pot Kung Pao Chickpeas recipe). 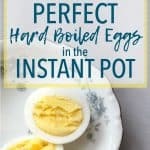 You can check out my full list of recommended Instant Pot accessories for pot in pot cooking, but for pot-in-pot brown rice, you’ll simply need a heatproof container that is small enough to fit into your Instant Pot but will also hold the amount of rice you’re cooking (and do keep in mind that the rice expands!). I generally use this bundt pan and cook one cup of dry rice at a time. You’ll simply place the trivet into the insert pot of your Instant Pot, then pour a cup of water into the insert pot. In your heatproof dish, combine the rice and liquid according to the same ratio as if you were making it directly in the insert pot. You’ll also use the same cook time and pressure release described above. Once the pressure has released, carefully lift out the dish and fluff the rice! Also, did you know that you can freeze leftover rice and then steam it in the microwave later, just like those little bags of frozen rice you can buy at the grocery store? So easy and SO MUCH cheaper! All you have to do is put a couple of cups of cooked rice into a zip-top freezer bag, press out excess air, and put it in the freezer. When you are ready to warm the rice, simply open the bag, add in a couple of tablespoons of water, and put it in the microwave (with the bag open) for about 3-5 minutes. Voila! 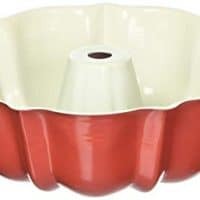 Heatproof dish – if using the pot in pot method (I use this bundt pan). Trivet – if using the pot in pot method. Making Instant Pot brown rice couldn't be easier! 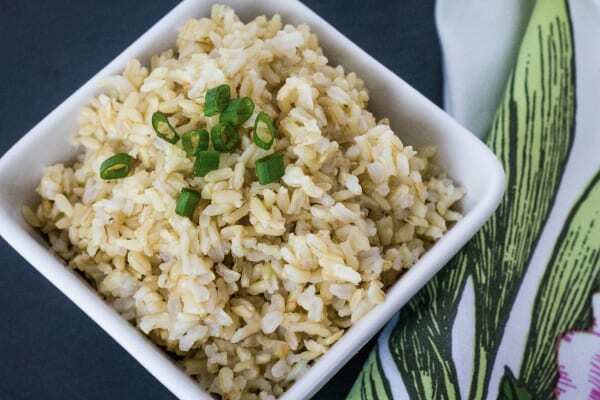 Set it and forget it, then enjoy your perfect brown rice as a quick side dish! 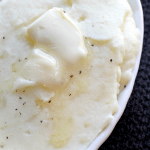 Combine rice, water or broth, and salt (if using) in Instant Pot. Close lid and set vent to "sealed" position. Using the manual setting, select high pressure for 22 minutes. 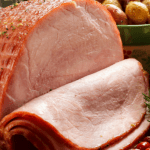 Allow a 10-minute natural pressure release after cooking, followed by a quick release of remaining pressure. You can also allow a full natural release of pressure. Once valve has dropped, open lid carefully and use a fork to fluff the rice. In a heat safe container that fits into your insert pot (I use a bundt pan, but a round cake pan or Pyrex dish would also work), add rice, water (or broth), and salt (if using). Using the Manual/Pressure Cook button, select a 22 minute cook time at high pressure. Once the cook time is complete, allow a natural pressure release for 10 minutes followed by a quick release of remaining pressure. You can also allow a full natural release instead. I prefer a rice to water ratio of 1:1.3, which means 1 cup of rice and 1 1/3 cups of water. Generally speaking, brown rice triples in volume when cooked. So one cup dry rice will yield about 3 cups of cooked rice. If you want to freeze some rice for later, place 2 cups of cooked rice in a zip-top freezer bag. Press out excess air and close bag, placing in the freezer. When ready to warm the rice, open the bag and add a couple of tablespoons of water to the bag. Place in microwave (with bag open) for 3-5 minutes or until fully warmed.